Thanks for the positive comments on my last post. I think I need to correct the impression I gave on this top, despite calling it a nurse's scrub top - I actually do like it! I will definitely wear this outfit and the fabric colors are perfect together. Perhaps I wrote that post after wrestling with the sizing on the top and was cranky. In any case - the alterations for size I was able to do make it totally wearable. 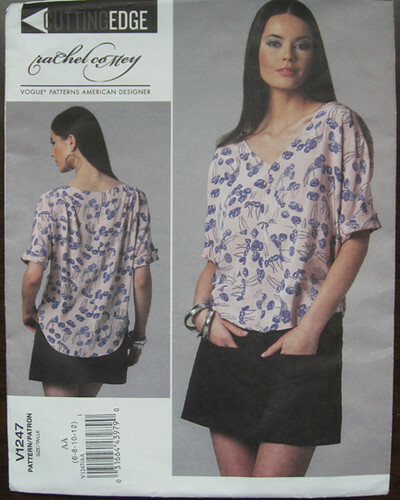 The pattern is Vogue 1247, Rachel Comey skirt and top. Miniskirt, I should say! I did add about 6 inches to the length. You can see my top is a bit less blousy than the model. See below for some pattern alterations. Based on the finished garment measurements printed on the pattern I started with a size 10 instead of my usual Vogue 12. Even then it seemed awfully big and that the armholes would be too low and wide, so I pleated out 1 inch from the front and back pattern pieces. Since it is unlikely I will make this again, I drew on the pieces with my fat colored pencils so you can see the changes. On the left is the front, the with the blouse bottom pieces pinned on so you can see the complete front. I pleated out 1 inch on each piece parallel to the straight of grain line, which will result in a 4 inch total reduction in circumference. 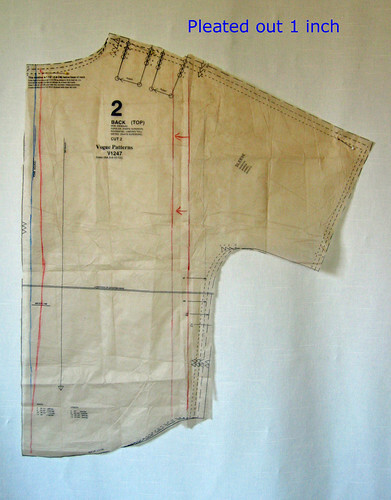 Red lines indicate the vertical pleat. 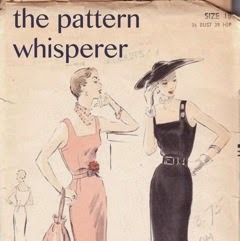 By the way - this pattern calls for french seams throughout. Nice touch but I had tossed that idea out the window the minute I opened the pattern envelope because it was obvious I would need to change the shape quite a bit for fit . . . and maybe more crankiness. I don't like patterns telling me how to finish the insides. Oh, very cranky indeed. When do I say "indeed"? Moving on. What else? Center front and center back seams. In the photos above, the blue line is the original seam allowance, the red lines are my actual seams so that gave some additional shaping and raised the center V a bit. I would have left the center front alone except the darts were a bit strange and stuck out in a strange and pointy way. Not really the look one is going for in a loose and flowy top, strange pointy darts. By tightening the center seam they were much shorter and landed in the right spot. The only drawback to all these changes is that the center front intersection no longer matched, but I am fine wth that and the very busy print obscures it when worn. It was very hard to decide which side of the denim to use as the right side. I love the red but the color match of this dot print kind of decided for me. The red and blue threads combine to make an inky blue denim that almost looks purple, a very cool color and something I will definitely be able to wear year round. Do you use the selvedge when you make waistbands? 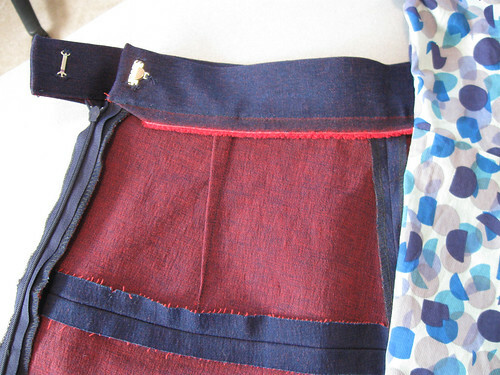 Even if I don't have to I love to be able to cut out the waistband to create a finished edge inside a skirt and in this case it has the cool red fringe. I did mention that I had a very small piece of fabric to start with, didn't I? Plus I wanted to add a few inches in length, so something had to be compromised. 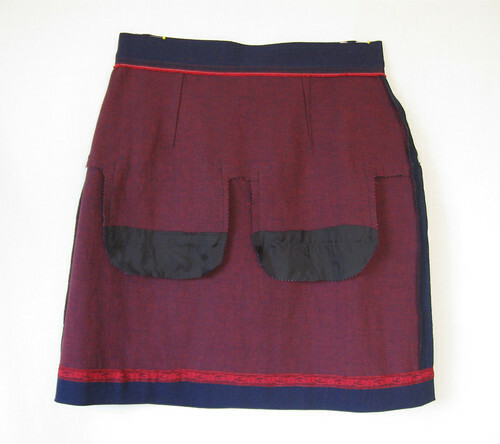 It was the cute little pockets which ended up being pieced with lining fabric on the bottom. It will never show but it does look funny. I feel like this is the photo in some strange sewing caption contest. I have some olive green wide wale corduroy in the stash so I think this skirt pattern will reappear in the fall but it is too hot to think about that now. 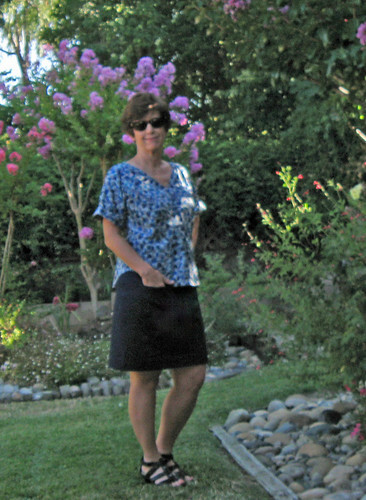 Here is today's SunnyGal garden photo, not my best photography, it was kind of breezy and all the flowers were moving. 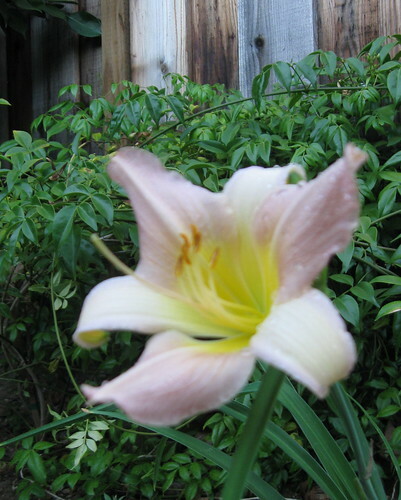 I always wanted to try daylilies, and bought this bulb from a display at the grocery store checkout. Flowers tempting me everywhere! Cute, cute, cute skirt! I love your fix for the pockets. Truly a "make it work" moment. It's great you plan to revisit this pattern. It would be all too adorable in the corduroy!!!! How do you settle on which is the right side when you get a denim that has great colours on both sides? 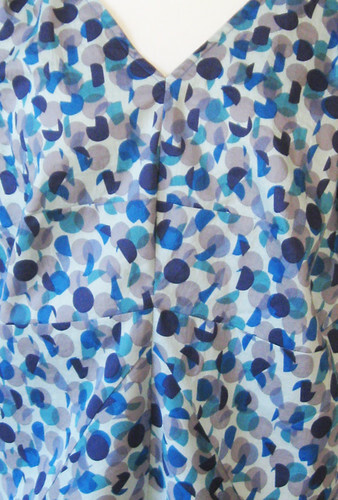 This is such a cute skirt, I bought the pattern too. Love how you made the top work for you. The skirt is great too! Very cute outfit! The denim fabric is so cool -- love the red side too. I'm not a loose and flowy kind of person as well, but sometimes, with the right outfit, loose and flowy works. And I think this outfit definitely works on you. 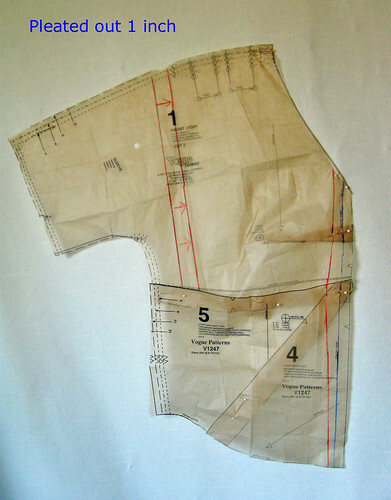 Your marked up pattern pieces are helpful. It's on my list to make but the last few reviews in PR haven't been very promising for a good outcome. I appreciate the information and really like the outfit combination. I really appreciate your sharing of this information. I made the top once but even using a size smaller found that I was swimming in it. I think I can go ahead now with different material and make a comfortable but not too loose top. Thanks again. I really like the alteration notes you have here. 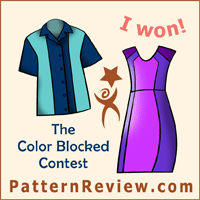 Thank you for posting!